UK, 2011, 88 minutes, Colour. John Boyega, Jodie Whittaker, Alex Esmael, Franz Drameh, Leeon Jones, Simon Howard, Luke Treadaway, Nick Frost. Seems as though this film has already achieved ‘cult status’ after its release in Britain. With Nick Frost appearing in it, it is instantly linked with Shaun of the Dead, one of his best-known films, with its blend of humour, horror and spoofing of horror conventions. This is what Attack the Block is attempting as well. Of course, it depends on your sense of humour and whether you are ‘blown away’ by small-budget films which highlight their poverty while being ambitious in their intentions. 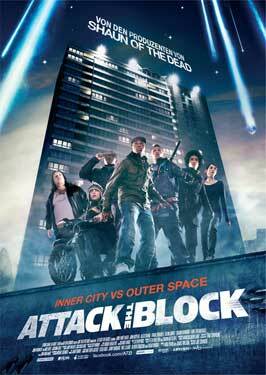 While some of it is amusing, Attack the Block seemed too silly to make the cult impression. On an ordinary London evening, a woman is harassed by a local gang. Alarmed, she rushes to her building. In the meantime, some aliens drop out of the sky. So, we are in the spoof alien invaders territory which is not necessarily a bad thing. But, the black puffball aliens with translucent blue eyes seem to be an admittance of no budget for real effects and seem quite ludicrous (which they are partly meant to be). The invasion multiplies as local authorities try to do combat, the aliens climb walls and get into the apartment block. The gang, as well as a local slacker calling in to get drugs from his dealer (Nick Frost) are terrified and enlist the aid to the woman they were attacking. In fact, they are just a gang of local kids who are still at school. Most of the kids are not the brightest and several of them are knocked off by the aliens. This means that the film builds up to a climax (not too bad) for final confrontations. Probably best seen at one of those midnight cult sessions. 1. The critical acclaim for the film? Popularity? Awards? 2. The criticisms of the film, low-budget, silly, the glorifying of the young thugs in the neighbourhood of London, the gangsta types? 3. The London setting, the neighbourhood, the streets, the blocks of flats? The narrow focus? Effective because of the focus? Microcosm for the attack of the aliens? The musical score? 4. The humour and irony of the film? How effective? The comic dialogue? The slapstick? The parody and spoofs? The playing on the idea of aliens and their attack? Human reactions? The gory touches and the deaths – ironic? 5. The title, the focus on the block, the block culture, Moses and his being leader of the gang, their proprietary role over the block? Sam and her presence, her being pursued, target, mugging and robbery? Her living in this area? The role of the police? 6. The attack of the aliens? The visualising of the aliens – corny, fuzzy, black, blue eyes? Too silly to be real? Or was that intended? The behaviour of the aliens, climbing the walls? The attacks, their deadly attacks? The mysteriousness of their motivation? Audiences relying on the B-budget traditions of science fiction and aliens? 7. Sam, her work, her social status, compared with the young men in the block? Her returning home, the underground, the street, the attack, her confrontation, her escaping? Later encountering the men in the block, their hold over her, their hold over them? Helping? The rescues, the confrontations, the fears? Survival? 8. Moses, the stereotypic leader, thug-like behaviour, the group, the mugging, the robbery? Their age, asserting themselves? The effect of their being pursued, being cut down to size, their ordinariness? Their interactions? Moses and his leadership, did the audience see another side of him? The limitations, the bravado in being the leader? 9. The group, as a gang, their age, loyalties, interactions with each other, slinging off, the violence? Pest and his comments, personality, flirting with Sam? Dennis, Jerome, Biggz? Their being in the apartment block? The different confrontations with the aliens, deaths? Serious and comic? 10. Brewis, the drugs, his encounter with the group, going upstairs to his dealer? The dealer, watching television? Their being high? Drug comedy? The aliens, their reactions, in the apartment, Brewis and his getting out, his preoccupation with the drugs rather than the aliens? 11. The girls in the apartment block, their lives, relationship with the gangs, haughty towards Moses and the others? Their becoming involved with the dangers, the aliens, their fears? 12. The characters around the block, their personalities, interactions? The police? 13. The aliens – and their appearance, behaviour, deadly? 14. The overall effect of the film – and it quickly becoming a cult film?